SKU: RCWA. Categories: Arches & Arbors, Wedding Accessories. 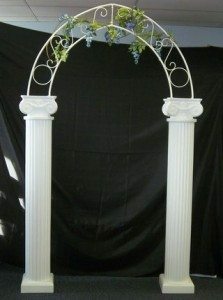 Beautiful Roman Style Arch, columns are 72″ Tall, top of arch is 8′ Tall, width of arch is 5′. Works well with a drape backdrop.